Ethnobotanical Leaflets 14: 546-58, 2010. A survey of the weed flora of the campus sites of the Olabisi Onabanjo University was undertaken. Several visits were made to the disturbed and undisturbed vegetation of the sites for collection of weeds after which the weeds were prepared in accordance with conventional herbarium practice. A total of seventy-three (73) weed species belonging to twenty-seven (27) families were identified and found to be present within the area of study. The family Poaceae seems to have the highest number of weed species (twelve) available within the area followed by Asteraceae with ten (10) species. Amaranthaceae, Cyperaceae and Euphorbiaceae are also in abundance. These weeds have been discovered to be useful, against the mindset of the uninformed that they are useless or �vagabond� plants. Medicinal uses as well as percentage occurrence of each family are presented. From this study it is obvious that the University sites are not only rich in plant biodiversity but that the plants are also very rich in socio-economic values. It is therefore advisable that these plants should be protected from going into extinction so that all would not be lost due to developmental activities. Key words: Weeds, �Vagabonds�, Ethnobotany, Medicinal uses, Olabisi Onabanjo University. Weeds are literally everywhere which make them a perfect object to observe. The richest soil if uncultivated produces the rankest weeds. An uninformed mind regards weeds as plants growing where they are not wanted; they are undesirable and considered to be pests just as insects. Harper (1944) defined weed as a plant that grows spontaneously in a habitat that has been greatly modified by human actions. As opined by Thomas (1956), a weed is a useless, undesirable and often very unsightly plant of wild, usually found in land which has been cultivated or in areas developed by man for specific purposes other than cultivation. Other authors (Bunting, 1959; Baker, 1965; Harlan and De Wet, 1965; Aldrich, 1984) have also given different definitions of weed. However Akobundu (1987) suggested that a plant is a weed either because it interferes with human activity and/or welfare or because it occurs spontaneously in human disturbed habitats. From the above it can be deduced that a good number of people regard weeds as �vagabond� plants with no homes and no useful purpose and can therefore migrate from place to place in different ecological systems where they are not wanted! A plant taxonomist will however agree with the definition of weed as a plant whose virtues have not been discovered (Blatchley, 1912). It is in this light that the so called weeds of our University campus sites at Ago-Iwoye were studied. Classification of weeds on the basis of where they are found (habitat) is widely used by agriculturists (Akobundu, 1987). This method of classification groups weed into upland (terrestrial) weeds, aquatic weeds, arable crop weeds, weeds of plantation crops etc. some weeds such as Chromolaena odorata (L) R. M. King & Robinson are classified as weeds of plantation crops while others such as Ageratum conyzoides Linn., Aspilia africana (Pers) C. D. Adams and Tridax procumbens Linn. are classified as weeds of arable crops. Binomial system of nomenclature is also used for the scientific classification of weed as in all other plant species (Akobundu, 1987, Soladoye and Oyesiku, 2008). HoIm (1982) noted that two families account for nearly 40 percent of the world�s most troublesome weeds. Terrestrial weeds are 23 percent grasses, 69 percent broadleaves and only 6 percent sedges, 2 percent ferns and fern allies. Among the aquatic weeds, 60 percent of the water weeds are monocots, 30 percent are dicots and 10 percent are ferns. Families of major weeds in the World include Poaceae (Gramineae), Asteraceae (Compositae). Cyperaceae (Nutsedge), Polygonaceae, Amaranthaceae, Fabaceae, Convolvulaceae, Euphorbiaceae, Malvaceae and Solanaceae (Akobundu, 1987). King (1966) and Baker (1974) outlined some characteristics of weeds among which are: high productive capacity, harmfulness to humans, animal and crops, spontaneous growth appearing without being sown and aggressiveness to mention but a few. Similarly, Batra (1981) suggested that an �ideal weed� should have characteristics that include ugliness, no wildlife value, numerous and easily dispersed seeds, unpalatability, spininess, allergenicity, toxicity, rapid vegetative growth etc. However, there is no single weed species that possess all the above listed characteristics since weed species with prolific seed production potential usually lacks wells� developed vegetative reproduction, so they cannot have the same or all the features of weeds (Johnson and Mullinix, 1998). Weeds have several economic and medicinal values. They provide a vegetative cover that protects the soil surface against erosion action of rain and wind; they play an important role in nutrient recycling. Some weeds serve as hosts for beneficial insects at the same time provide nectar for bees, weeds add organic matter to the soil. Some weeds play important role as sources of drugs used in orthodox medicine, while others have been used locally for decades for several traditional medicinal purposes ranging from simple laxative to cure dysentery (Hill and Ramsay, 1977; Soladoye et al., 2006). Some examples of weeds that yield useful drug extracts for modern medicine include African vine (Strophantus gratus (Hook.) Franch - a source of the drug Strophantin which is used for heart disease and Zanthoxylum zanthoxyloides (Lam.) Waterm which yield antisickling agent called NIPRISAN (Lehane, 1977; Soladoye et al., 2006). It is known that more than 40, 000 species of tropical flowering plants have medicinal properties; this has made traditional medicine cheaper than modern medicine (Akpalu et al., 1994). Some plant decoctions are of great value in the treatment of diarrhea or gastrointestinal disorders, urinary tract infections, skin infections, infertility, wound and cutaneous abscesses (Meyer et al., 1996). Weeds are also important source of pesticides. An example is Chrysanthemum cinerariifolium (Trev.) Bocc, which provides the insecticide pyrethrum. The present study aims at identifying a number of weeds found in the two sites (Permanent site and Mini Campus) of Olabisi Onabanjo University, Ago-Iwoye, Nigeria. This work also outlines the ethnobotanical importance of these weed species identified on the campus sites. The location, climate and vegetation of the study areas had been described in our earlier paper (Soladoye et al., 2005). Briefly, the Olabisi Onabanjo University campus situated in Ago-Iwoye falls within the equatorial belt of Nigeria at longitude 30� 55'' east of the Greenwich Meridian and latitude 6� 56'', north of the equator. Ago-Iwoye is about 7km from Oru and about 5km from Ijebu-Igbo, which are the two major towns in the Ijebu North Local Government area. The town is about 100km southeast of Abeokuta, the Ogun State capital (Master plan, 1985). The site lies to the south-western part of Ago-Iwoye approximately 35km from the centre of the town and is bounded on the north by Ijebu-Igbo/Oru/Ago-Iwoye/Ijesha-Ijebu/Ilishan road and on the east by Ago-Iwoye/Imodi-Imosan/Ijebu-Ode road. The perimeter roads are connected to Lagos-Benin expressway and the Ijebu-Ode/Ibadan road. The tropical rain forest to which the vegetation of the campus belongs constitutes an evergreen plant community rich in trees, shrubs and herbs. The climate is characterized by high temperature and a bimodal rainfall pattern. The annual rainfall ranges from 1250 to 2190 mm beginning from mid-March to mid-November, with the peak in July and September. The mean annual minimum and maximum temperatures are about 20�C and 30�C respectively, while relative humidity is approximately 60% in the dry season and 90% in the rainy season. The survey involved several visits to the campus sites for collection of samples. Specimens were collected across the undisturbed and disturbed vegetation of the sites. Care was taken to make sure that the entire, vigorously growing typical specimens of individuals representing almost all of the natural population was collected. Insect-damaged specimens were avoided likewise those rare or uncommon plants appearing to be the only plant of a species at a locality. In accordance with conventional herbarium practice, the samples were dried, poisoned and mounted on mounting sheets. The poisoning was done with a mixture of mercuric chloride and phenol in 70 % methylated spirit. Identification of the specimens was done by the senior author and confirmed by experts by comparison with herbarium specimens in both Elikaf herbarium of the Olabisi Onabanjo University (not listed in Holmgren and Keuken 1974) and the Forest Herbarium, Ibadan (FHI). The field note which indicates the collectors name, date and place of collection, determinavit, habit, name and description of specimen was also attached to each of the mounting sheets on which the specimens were mounted. All voucher specimens were deposited at the Elikaf herbarium. From the survey, a total of seventy-three (73) weed species (Table 1) belonging to twenty-seven (27) families were identified as constituting the major part of the weed vegetation of both sites. The family Poaceae has the largest number of species (twelve) followed by Asteraceae (ten). Amaranthaceae and Cyperaceae both have seven species each while Euphorbiaceae has six (Table 2). The dominance or superiority of the Poaceae and Asteraceae could be due to several climatic and environmental conditions as well as the soil type. It could also be as a result of seed dispersal mechanism of the members of the families. Figure 1 shows the Bar chart representing the number of species belonging to each family and Figure 2 shows the Pie chart which represents the percentage occurrence of the families to which the species belong. Chromolaena odorata (L.) King and Robinson, Ageratum conyzoides Linn, Phyllanthus amarus Schum, Bryophyllum pinnatum (Lam.) Oken, Gomphrena celosioides Mart, Cyperus esculentus Linn, Heliotropium indicum Linn, Imperata cylindrica (L.) Beauv, Momordica charantia Linn, Talinum triangulare (Jacq) Willd, Vernonia cinerea (Linn.) Less and Thom Aspilia africana (Pers.) C.D. Adams were found in almost all areas of the sites. This supports the fact that weeds are notorious and inevitable in all vegetation types (Soladoye et al., 2005). The weeds studied have rapid growth and cover extensive areas. They grow in mass when they have been controlled by weeding, showing the degree of aggressiveness of the weed. These weeds are ruder weeds as described by Holzner (1982). These weeds are weeds of disturbed non-crop areas such as rubbish heaps, landfills, path and roads, compost heaps and drainage. From the present study, weed persistence is affected by climatic, soil and biotic factors. These weeds are observed to persist because animals like goats do not graze on them. The climatic condition is also observed to be conducive as the weed, that need rain to grow, get enough at appropriate time while the ones that require dry season are also favoured during dry season. The major factor that is observed to affect their persistence is man in the course of maintaining a clean and neat surrounding but the weeds still sprout in places where they cannot be controlled easily. These weeds generally provide vegetative cover to protect the soil surface against water and wind erosion. In addition to their agricultural uses, many weeds, such as Alternanthera sessilis, Acalypha fimbriata, and Mariscus flabelliformis have medicinal properties and are used extensively in homeopathic and naturopathic medicine. As seen in Table 1, the weeds have their respective medicinal/ economical uses. The leaves and fruits of Momordica charantia Linn are used as an anthelmintic and a purgative (Adesina et al., 1995). Chenopodium ambrosiodes Linn when fresh is used as anthelmintic and ascaricide. It is also used for hookworm and in veterinary.� Boerhaavia diffusa L have also been used to treat convulsions and as a mild laxative and febrifuge. The roots and leaves have an expectorant action and the roots are applied as a poultice to draw abscesses and to encourage the extraction of guinea worms (Adesina et al., 1995). Many published reports have also shown the effectiveness of traditional herbs including weeds against microorganisms; as a result, plants are the bedrock for modern medicine to attain new principle (Evans et al., 2002). In this regard, plants have given western pharmacopoeia about 7,000 different pharmaceutically important compounds and a number of top-selling drugs of modern time e.g. quinine, artemisinin, taxol, etc (Odugbemi 2008). It is therefore important to note that there is the urgent need to preserve the genetic diversity of all plant resources of known and unknown economic importance (including weeds) which will guarantee the availability of all potentials for use for the benefit of our children and grandchildren (Olowokudejo 1987). Gbile et al. (1981, 1984) revealed that about four hundred and eighty plant species of the Nigerian flora have been described as endangered or rare, out of which many of these are being studied at the Forestry Research Institute of Nigeria, Ibadan. Oguntala (1993) noted clearly that, apart from the gradual loss of biodiversity, the devastating environmental disasters in urban and rural areas of Nigeria indicate that these environments are under stress and require urgent intervention. Lack of conservation measures will amount to an increase in the number of endangered species and this will ultimately result in extinction, which is the gradual but sure elimination of taxa (Allaby, 1998). In the light of the ethnobotanical, ecological, and other socio-economic importance of these weeds it will be inappropriate to consider this group of plants as �vagabonds�. However, weeds have also been known to cause several damages to crops, reduce quality of harvested agricultural products and impede water flow in irrigated canals. Adesina, S.K., Gbile, Z.O., Odukoya, O.A., Akinwusi, D.D., Illoh, H.C. and Jayeola, A.A. (1995). Survey of indigenous useful plants of West Africa with special emphasis on medicinal plants and issues associated with management. The United Nations Programme on Natural Resources in Africa; 2nd edition, pp. 84-85. Akobundu, I.O. (1987). Weed Science in the Tropics: Principles and practices. John Wiley & Sons, Chichester, pp. 522. Akpalu, I.N., Dada, J. D., Odama, E. L., and Galadima H. (1994). Antibacterial activity of aqeous extracts of some Nigerian Medicinal Plants. Nigerian Journal of Botany I7, 45-48. Aldrich, R.J., (1984). Weed-Crop Ecology: Principles in Weed Management. Breton Publishers, North Scituate, pp. 465. Allaby, M. (1998). Oxford Dictionary of Plant Sciences. Oxford University Press, Oxford. Baker, H.G. (1974). The Evolution of Weeds. Annual Review of Ecology and Systematics 5, 1-24. Blatchley, W.S. (1912). The Indiana Weed Book. Nature Publishing Conpany, Indianapolis, Indiana. U.S.A., pp. 191. Bunting, A.H. (1959). Some reflections on the ecology of weeds. In: Harper, J.L. (Ed), The Biology of Weeds, Symposium of the British Ecological Society. Blackwell Publishers, Oxford. Evans, C.E., Banso, A. and Samuel, O.A. (2002). Efficacy of Some Nine Medicinal Plants against Salmonella typhi: an in-vitro Study. Journal of Ethnopharmacology 80, 21-24. Gbile, Z.O, Ola-Adams, B.A., Soladoye, M. O. (1981). Endangered Species of the Nigerian Flora. Nigerian Journal of Forestry 8 (1), 14-20. Gbile, Z.O., Ola-Adams, B.A. and Soladoye, M. O. (1984). List of Rare Species of the Nigerian flora. Research paper Forest Series No 47, FRIN, Ibadan. Harlan, J.R. and De Wet, J.M.J. (1965). Some thoughts about weeds. Economic Botany 19, 16-24. Harper, R.M., 1944. Preliminary report on the weeds of Alabama. Alabama University, Alabama, Bulletin of Geological Survey 53, 275. Hill, B.S. and Ramsay, J. (1977). Weeds as Indicators of Soil Conditions. Ecological Agricultural Projects Publication 67. Holm, L.G. (1982). The Biology and distribution of some weeds important to the Tropics. Proc. Int. Conf. Pl, Prot in the Tropics, Malaysian Plant Protection Society, pp. 85-97. Holmgren, P.K. and Keuken, W. (1974). Index herbariorum. Part I, ed. 6. Regnum Vegetabile 92, 1-397. Holzner, W. (1982). Concepts, categories and characteristics of weeds. Pp. 3-20 In: Holzner, W., Numata, M. (Ed. ), Biology and Ecology of Weeds, Junk Publishers. The Hague. Johnson, W.C. and Mullinix, B.G. (1998). State seedbed weeds control. Weed Science 46, 698-70. King, L.J. (1966). Weeds of the World: Biology and Control, Interscience Publishers, New York, pp. 526. Lehane, B. (1977). The Power of Plants. John Murray, London, pp. 288. Meyer, J.J.M., Afolayan, A.J., Taylor, M.B., and Engelbrecht, L. (1996). Inhibition of Herpes Simplex Virus by Aqueous Extracts from Shoots of Helichrysum aureonites (Asteraceae). Journal of Ethnopharmacology 52, 41-43. Odugbemi, T. (2008). Outlines and Pictures of Medicinal Plants from Nigeria. University of Lagos Press. Revised Edition, pp. 54. Oguntala, A.B. (1993). Forestry for Urban and Rural Development in Nigeria, with particular reference to urban Environment. Pp. 1-10. In: Oduwaiye, E.A. (Ed. ), Proceedings of the 23rd Annual Conference of the Forestry Association of Nigeria. Ikeja, Lagos State. Okoli, E.O. and Wilcox-Evwaraye, H. B. R. (1992). Plant collection, identification and storage In: Okoli, B. E. (Ed. ), Field, Herbarium and Laboratory Techniques, Mbeyi and Associates (Nig.) Limited, Port Harcourt, pp. 239. Olowokudejo, J.D. (1987). Medicinal plants used as Vermifuges in Nigeria and Their Conservation. 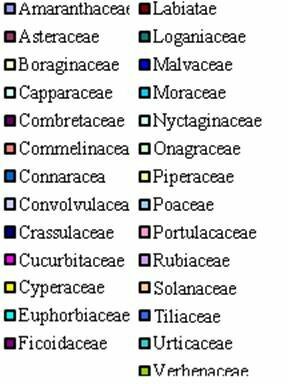 Journal of Economic and Taxonomic Botany 9, 459-466. Soladoye, M.O., Sonibare, M.A., Nadi, A.O. and Alabi, D.A. (2005). Indigenous Angiosperm biodiversity of Olabisi Onabanjo University permanent site. African Journal of Biotechnology� 4 (5), 554-562. Soladoye, M.O., Yakubu, F.A., Kola-Oladiji, K., Alabi,, D.A. and Agbomeji, Y.O. (2006). The Collection, Conservation and Cultivation of Local Medicinal Plants for Natural Medicine Production. Paper presented at the Seminar/Workshop and Exhibition of natural Medicine products. Organized by Nigeria Traditional Medical Association, Ijebu-North in collaboration with Faculty of Science, Olabisi Onabanjo University, Ago-Iwoye held 19th-23rd September, 2006. Soladoye, M. O. and Oyesiku, O. O. (2008). The Taxonomy of Nigerian Medicinal Plants. Pp. 93-149. In: Odugbemi, T. (Ed. ), A Textbook of Medicinal Plants from Nigeria. UNILAG Press, Lagos, Nigeria. Thomas, W.L. (Ed.). (1956). Man�s role in changing the face of the Earth. An International symposium sponsored by the Wenner Gren Foundation for Anthropological Research. Univ. of Chicago Press, Chicago, pp. 193. Table 1. Alphabetical list of weeds collected from the area of study with their medicinal/other uses. Ulcer, rheumatism, asthma, syphilis and antifungal infections. Wounds, ulcer, digestive disturbance. Concoction of the leaves is also used as tonic. Leaf sap used for medicinal urposes. Have potential as a source of honeybees. Leaf-sap instilled into the eye for conjunctivitis. Plant infusion used as mild laxative. Dysentery, malaria fever, leaf sap used for blood clothing. Black tongue, appetizer, weakness, anti pyretic. It is used as cover crop. Leaves have mild laxative properties. Scabies, gonorrhea, urinary ailments, antipyretic. Asthma, antipyretic, gynaecological diseases, gonorrhea, arthritis. Boiled leaf taken to cure constipation. Fruit is a source of vegetable sponge. Fruit infusion in oil applied to burns. Grass provides good forage for cattle. Mental disorders, leaf also applied to cancer of the breast. Leaf infusion used for hemorrhoids. Leaf infusion taken for catarrh, dysentery and nephritis. Infusion of leaves drunk as laxative. Weak infusion taken as a diuretic and vegetables. Leaves are used as vegetables in soup. Table 2. Distribution of the families showing their percentage occurrence. Fig. 1. 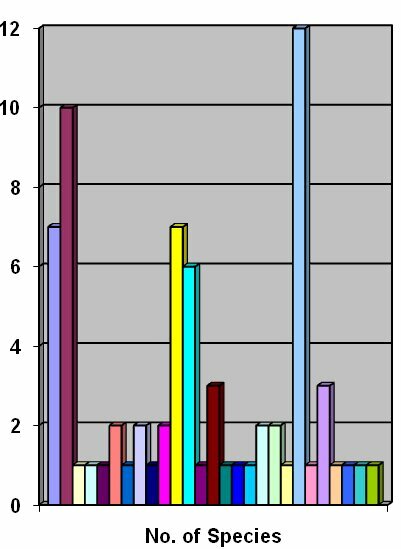 Bar chart showing the no. of species belonging to each family. Fig. 2. 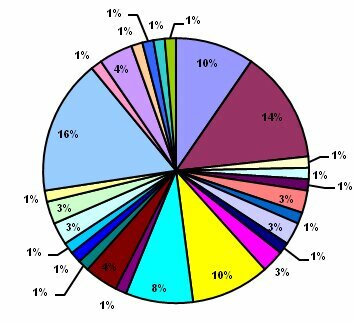 Pie chart showing the percentage family occurrence of the weeds.